Where is La Fosse located ? La Fosse is a few minutes from the D55 which runs through Perriers-en-Beauficel. Perriers-en-Beauficel itself is 16 kilometres (about 15 minutes) south of Vire. Other towns nearby are Mortain, Villedieu-les-Pôeles, St-Hilaire-du-Harcoüet and Sourdeval. Approximate travel times to / from the main ferry ports. The times and distances are estimated under ideal conditions. Actual times and distances will vary depending on driving style, traffic, the number of breaks taken en route and any diversions in force on the day. The airports of Rennes, Dinan, Dinard, Brest and Caen-Carpiquet serve the region. Airlines flying to these airports sometimes change so check carefully what route suits you best before booking. 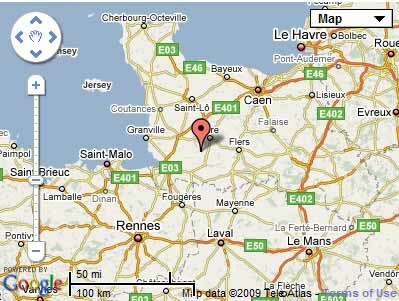 Airports are approximately 90 minutes from La Fosse - some airports have car hire offices on or adjacent to the airport. For a detailed route to Perriers-en-Beauficel, try http://www.viamichelin.fr/ or use http://www.viamichelin.co.uk/ and change the country to "France". There are also sites offering "cheap ferry tickets" so if you are booking online it is worth researching to see if you can save money via one of these websites. We have not used any of these company so have no recommendations.